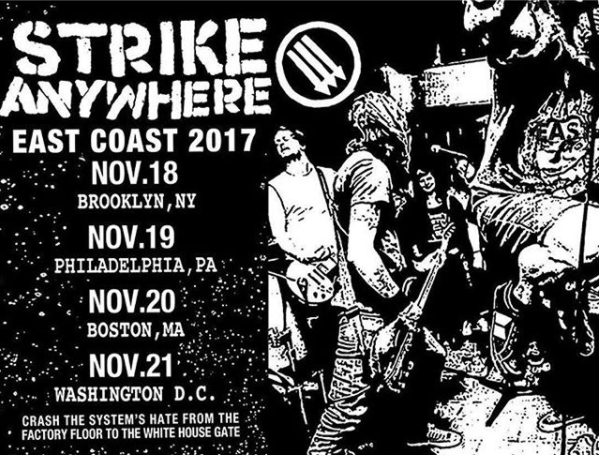 Strike Anywhere have announced a run of East Coast shows! They will be hitting Brooklyn, Philadelphia, Boston, and Washington DC. For more info make sure to head to the band's official page. Strike Anywhere have announced a short east coast tour with long-time friends A Global Threat. It's the band's first batch of stateside dates in some time. An as-yet-unannounced third band will also be on those shows. Check those details out below, as well as upcoming European tour dates and The Fest/Pre-Fest days. Strike Anywhere have announced a pair of shows in Germany with Authority Zero and Idle Class. Check those dates out below. More shows are promised to be announced soon. The band released the double live album In Defiance of Empty Times in 2012 and Iron Front in 2009.